Black looks better to me! 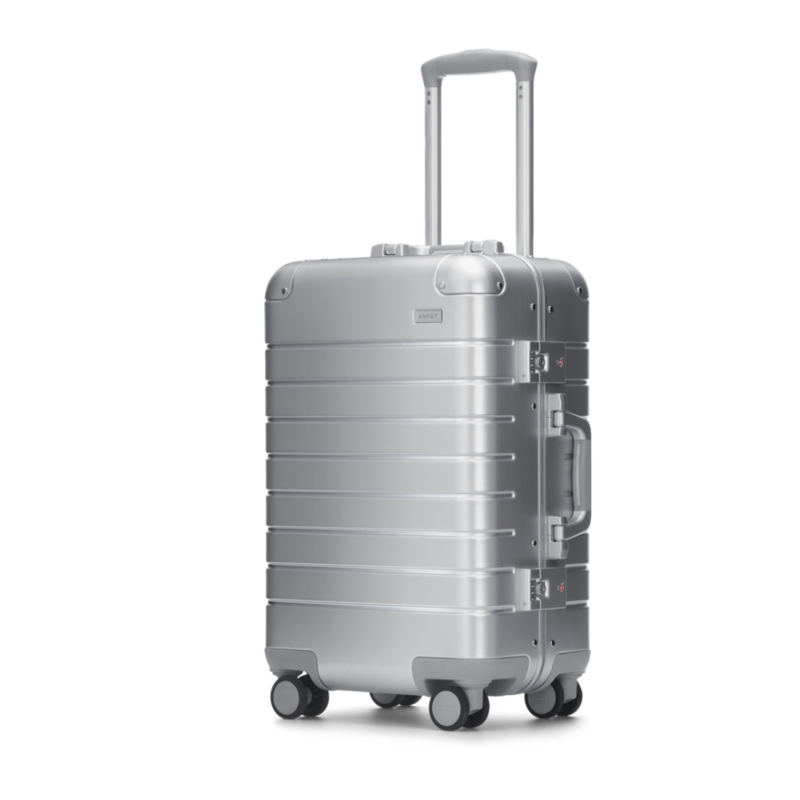 I personally prefer non zippered luggage and Rimowa makes some of their bags with latches instead of zippers. This makes getting in and out of the bags a snap. But I’m here to write about Away Luggage. For the money, I don’t think you will find luggage as good as theirs. They make their bags in polycarbonate and aluminum (like Rimowa) but cost a third as much. They also have some very innovative features such as a battery that is built into their carry on bags and can be removed as well. Our kids love having a batter in their carry-on bags to keep their iPads full of power. You can pop out the battery and use on the plane when the bag is in the over head bin. A carry-on bag that meets all airline size requirements. Typically this is 22 inches by 9 inches by 14 inches and about 36L-39L of storage. Enough for 3 days. Away Carry-On also in Aluminum. A large-carry on bag that meets some airline size requirements. Typically this is 22 inches by 10 inches by 15 inches and about 45L-48L of storage. Enough for 5-7 days. Away Bigger Carry-On. A checked bag that is about 65-68L. Any bigger than this and it will probably exceed the weight requirements of most airlines (50 lbs) and be too tall to comfortably carry up stairs and get in and out of most trunks. Away Medium. If you are unsure about the regular vs large carry on bags Away has this handy chart. I fly British Airways a fair amount and the large carry on is big enough for 5 days of clothing. Unfortunately, last year Alaska scaled back their carry on limits for no good reason, and now don’t allow the larger carry on size and you are limited to 45 linear inches. Away makes bags in all three sizes - in polycarbonate and silver aluminum. I would stay away from their other bags. They also have hybrid models with soft outside pouches - I also don’t recommend. One of my favorite features of aluminum bags is you can open them while they are standing up. They also make sturdy seats for waiting in line. They have some fantastic special edition colors as well. We have two away bags (regular carry-on) for my kids now that they are old enough to (mostly pack) and carry / manage their own luggage. These bags are awesome and the kids love them. If you want to buy one and want $20 off your first order click here. Note I also get a referral credit for this.